Kicking off with a Dumpling Party where guests learn to make dumplings as they sip cocktails, the week-long LUCKYRICE Festival returns to NYC. Kicking off on April 29 with a Dumpling Party where guests learn to make dumplings as they sip cocktails, the week-long LUCKYRICE Festival returns to NYC. Hailed by thousands of attendees as one of the best food festivals in NYC, LUCKYRICE is also bringing its special spin on Asian culture through cuisine to Los Angels, San Francisco, Las Vegas, and Miami. Still the biggest jewel in the crown of LUCKYRICE Festivals, the New York City festival boasts 11 different events spanning seven days and nights. Every year LUCKYRICE opens with a cocktail party, only this year cocktails will be paired with a plethora of dumplings, and include dumpling-making lessons. A tradition found all over China, attendees will make like family as they create and consume all kinds of dumplings at the LUCKYRICE Parlor on Bowery. For addicts of Chinese dumplings, this event is a must. On April 30, SlurpFest: A Ramen Dinner takes over the LUCKYRICE Parlor with chefs from Yuji Ramen, Ramen Lab, Chuko, and Ivan Ramen NY. Featuring regional ramens like tonkotsu of Kyushu and miso ramen of Hokkaido, chefs will add their own modern, creative spin on the traditional noodles of Japan. James Beard Award winner for Best Chef, Saipin Chutima of Lotus of Siam in Las Vegas comes to NYC for Saipin's Siam Supper on May 1st. Lauded as one of the best Thai chefs in North America, Saipan Chutima cooks modern Thai cuisine using traditional Thai spices and chilies, creating dishes that won her restaurant the title of Best Thai in America by Gourmet Magazine. Three different dinners at three venues on May 2nd offer LUCKYRICE goers a choice that isn't so easy to make. Cocktail Feast: A Journey East, hosted by Chef Masaharu Morimoto brings chefs out of the kitchen and places them behind the bar. Chefs José Andrès, Andy Ricker and Angelo Sosa join Morimoto at The Bowery Hotel where they morph into mixologists and show the crowd what a talented chef can do when you give them some Bombay Sapphire EAST and a shaker. Also on the second are a Filipino Feast at the James Beard House and Rasta! A Chinese-Jamaican Dinner at LUCKYRICE Parlor. Again offering Asian food enthusiasts a choice, on May 3rd LUCKYRICE brings back its Grand Feast to the Grand Ballroom at the Mandarin Oriental Hotel while hosting This Stinks! Fermented Food Favorites from Asia at LUCKYRICE Parlor. 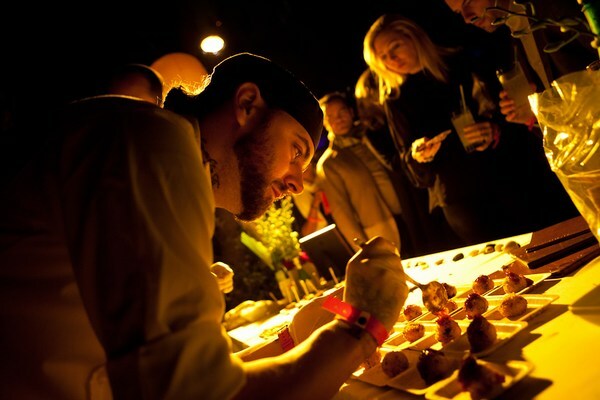 Along with its Night Market on May 4, the LUCKYRICE Grand Feast is one of the two most popular events. The Grand Feast offers a cornucopia of cuisines spanning the wide spectrum of Asian and Asian fusion foods. Chefs Jehangir Mehta of Mehtaphor, Brad Farmerie of Public, and Cedric Vongerichten of Perry Street, join Morimoto and a couple dozen other top chefs from across the city, country and globe to give guests a walk-around tasting that's virtually second to none on the festival circuit. As no Grand Feast is complete without drinks, and LUCKYRICE isn't one to curb your craving for cocktails, guests can liquor-up on limitless libations. This Stinks! isn't for the faint of stomach, or nose. With dishes like Fermented Tea Leaf Salad, Fried Stinky Tofu with Pickles, and Braised Beef Rib with Fermented Pan Chan, one can only imagine what the venue will smell like by the middle of the meal. But if you've ever wanted to make like Anthony Bourdain and Andrew Zimmern and take a walk on the wild side, this dinner is for you! Moving from its previous venue under the Archway in DUMBO, this year the Night Market will take over the North Cabana at Meatpacking's Maritime Hotel on May 4th. Again emulating the experience of an authentic Asian night market, LUCKYRICE brings together chefs from Pok Pok NY, QI Thai Grill, Toki Underground and more, for an all-you-can eat event that's just a bit more posh than the experience one has at an actual night market. But it's not the glitz of the Grand Feats that one wants to experience at a night market; it's the hustle and bustle of late night street food that makes a night market such a unique experience. Also on the 4th, A Nice Rice Dinner, hosted by Jonathan Wu of Wu Pops Up, celebrates the fundamental food staple of Asia. Sticky rice, rice crêpes, steamed rice rolls and rice congee are just a few of the rice dishes that highlight the diversity of rice in all of its culinary manifestations across Asia. Hardly a boring prospect, LUCKYRICE proves that having rice for dinner can be a gastronomic adventure. Saving what could be the best for last, on May 5th Chef Susur Lee of Lee in Toronto hosts a Dim Sum Mahjong Bloody Mary Brunch. Adding the American twist of the brunch-lovers Bloody Mary to the Cantonese tradition of Dim Sum, LUCKYRICE offers guests the opportunity to mix up their own Bloody Mary using Asian specialty ingredients like yuzu, lemongrass and wasabi. Not to miss will be Chef Lee's Char Siu Bau -- steamed roast pork buns -- a humble yet favorite Dim Sum dish that paved the way for the pork bun craze that hit NYC. With so many different events celebrating the vastly diverse cuisines of Asia, LUCKYRICE will no doubt again prove a hit among food and fun-loving New Yorkers. But don't let the panoply of parties fool you into thinking you can nab tickets last minute. Every year LUCKYRICE sells out fast, so if you have a hankering for the best Asian food this side of Hong Kong, visit the LUCKYRICE website.